Didnt do the job so i had to use the old set . I ordered the SP1917-N but the set i received had a different number on the sticker and the 1917 was written with pen . I dont know if it was a mistake on the sticker or it is one size for varius numbers . The fact is that the pieces stuck when i put them in their place and didn't let the variator work . The scooter is an Aprilia sportcity 125 model 2007 . TechPulley sliding roll size 19x17mm, weight 8 grams 6 pieces / package. TechPulley sliding roll size 19x17mm, weight 7 grams 6 pieces / package. 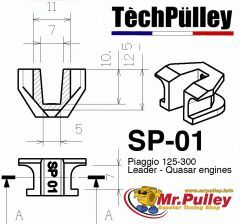 TechPulley sliding roll size 19x17mm, weight 9 grams 6 pieces / package. 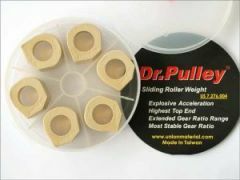 Dr.Pulley sliding roll size 19x17mm, weight 8,5 grams 6 pieces / package.